Our goals is to make managing Joomla articles as easy as possible. Instead of using one html-editor (wysiwyg) you can define a simple form with fields in Form2Content. The field data like text, images, links etc. are than placed into an article template. Together this creates the normal Joomla article. You can even see it in the Joomla article manager! 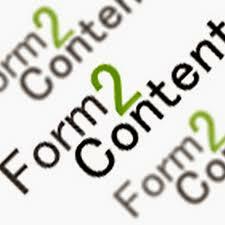 Form2Content also allows users to submit Joomla articles in the front-end via the front-end article manager. Using the Joomla ACL you can set whether you see all articles or just your own or whether you can edit, create or delete articles. To create the 100% Joomla articles we 'paste' the form data into article templates. Together the data and template layout forms the Joomla article html. In the article template you can add html layout, framework css, Joomla content plugin syntax or even modules if you like. This way your user who submits the form needs no knowledge of this. And what's more, all your articles for each content type look the same! We are "Joomla compatible"! Since Form2Content creates Joomla articles we work with all extensions that use com_content but also with all Joomla content plugins. This way you decide which review extension, gallery plugin or slideshow you want to use. YOU decide which gallery, slideshow, review or commenting system etc. you want to use.